This weBLOG contains writings and comments about all aspects of this adventure. Starting from early on in the application stages I'll keep comments here regarding fundraising, training, and ultimately the bike ride itself. It won't all be pretty: $10 000 is an enormous fundraising goal, 9 weeks on a bike is not a walk in the park, and living with a bunch of other crazy cyclists for 2 months is likely to generate some stories. If you read RSS feel free to subscribe to updates from my blog. Drag This Link into your favorite reader. This webpage is currently configured to extract blog entries using my journal management software that are indicated to be on the topic of SeatoSea. 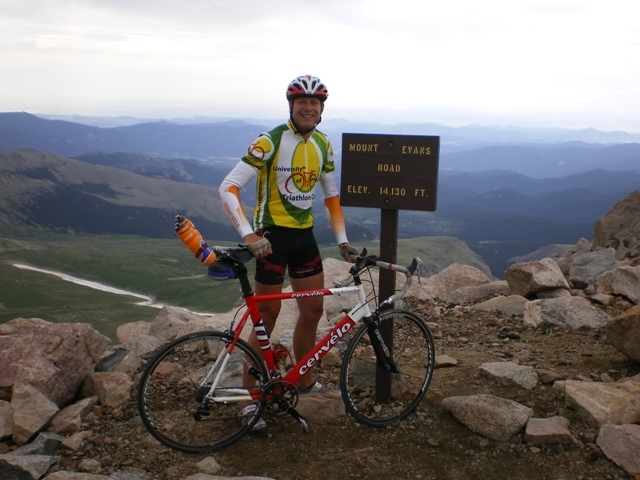 You may also be interested to read other blog notes about Cycling or Triathlon on my personal website. We departed Winter Park and set out for Berthoud Pass at 7:20 am with anticipation of what might be our most exciting detour to date. A damper was put on the excitement when there was a crash in the paceline and Tyler Buitenwerf broke his shoulder in two spots. He is done riding for the tour. Please pray that he'd manage this devastating news well and that there will be full healing in those bones. He appeared in good spirits when I arrived in camp and he told me the news later on in the evening. 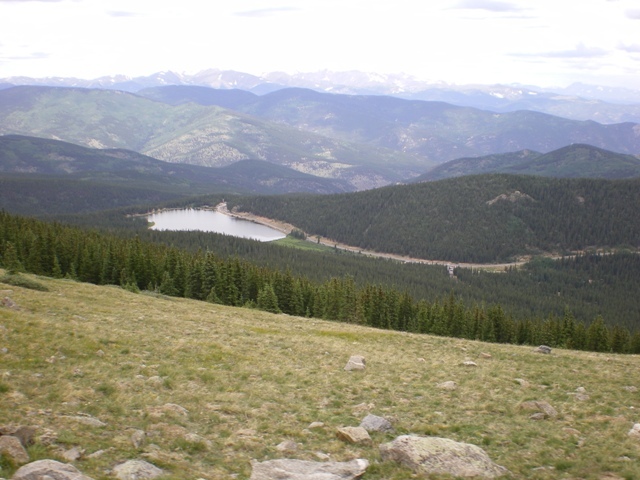 Berthoud Pass rises to 11307 feet above sea level. Compare this with the summit of Mount Temple near Lake Louise at 11624 feet which is the peak of the highest mountain in Banff National Park. This was merely a pass between two peaks and was nearly as high! The climb was gentle at 4% and 5% grade which is quite manageable but the air does get thin and people were breathing hard at the top. I was absolutely no exception and my heart rate stayed way high for a solid 2 minutes once at the top, my body just racing to try and catch up with the oxygen supply. After the very quick descent we continued to loose elevation but the speeds were manageable to co-operate in a paceline.. and hence easy enough to film. I caught my meter on camera going ~50 kph. 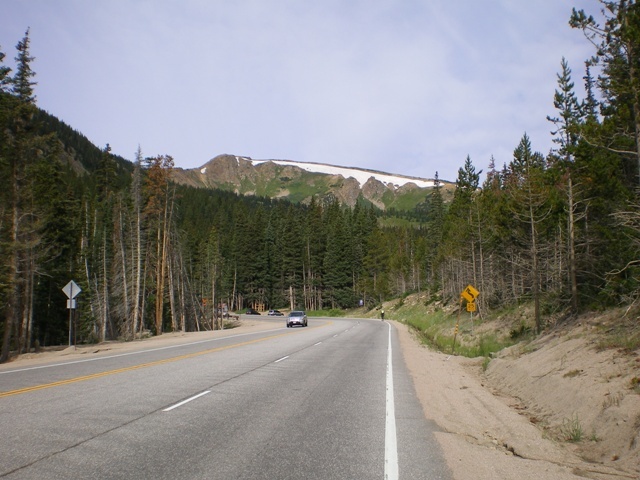 We then continued along the "official" seatosea route to the town of Idaho Springs where we turned right and began climbing once again starting from 7526 feet above sea level. I should identify "we" at this point: Josh Krabbe, Reuben Vyn, Nicolas Ellens, Alex VanGeest, John Vanderveen, Eritia Smit, Lawrence Bakelaar, Brad Geerlinks and Peter Kranenburg. Reuben and Alex had parents visiting and they served as our personal support vehicle for the excursion. 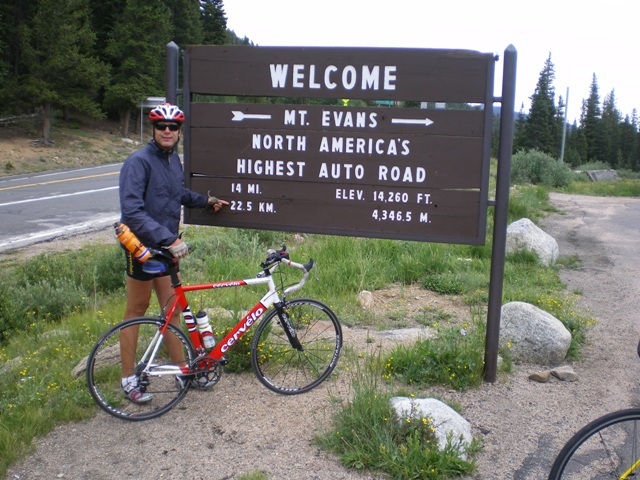 We climbed 14 miles to Echo Lake at 10600 feet above sea level and took a break and then continued up the road to the summit of Mount Evans at 14130 feet above sea level. Needless to say, the air is thin up there. We were greeted with rain and a temperature of 45 F or 7 C.
Turning around we blasted down the mountain back to Echo Lake wearing every scrap of clothing we could find. Some was even borrowed from Reuben's Mom who could ride down in the heated car. 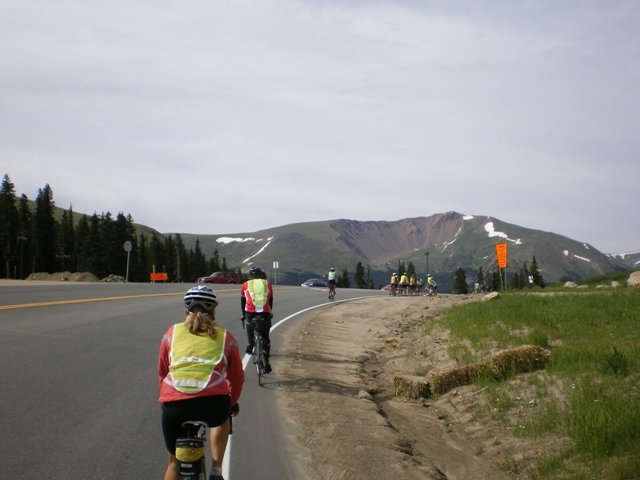 Once off the main stretch of the mountain we stripped down to normal riding attire, ate again, regrouped and then set out to catch one more pass (Squaw Pass) on the way to Denver. 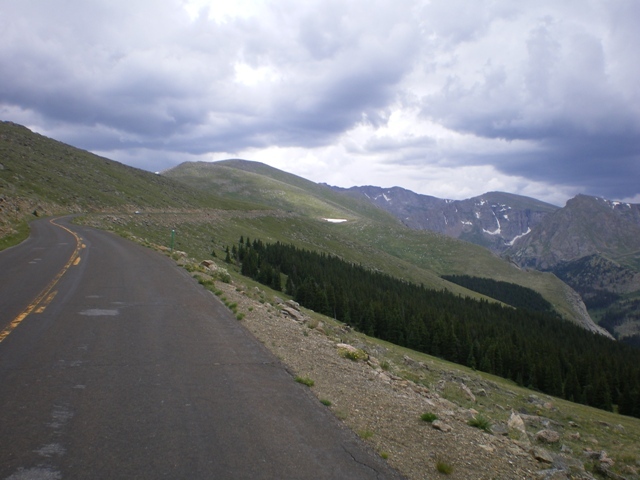 From the base of the Mount Evans road on down into the first suburb of Denver we averaged 45.4 kph for 53.9 kms. That's blazing fast for an average speed. It included a 9.4 kilometer stretch where my speed never fell below 50 kph. By the time we had reached camp our total for the day was 224 kms in 8 hours 2 minutes (27.9 kph). After a bit of work online pouring over many resources we tallied up the total elevation gained for the day to 11550 feet. That's more elevation gained in a single day than if we had somehow started at sea level and summitted Berthoud! The RCA and CRC churches in Denver have been excellent hosts for us. Ice cream, haircuts, care packages, billets for some of the riders and lots and lots of cookies. I also received mail here from River Park Church in Calgary with a huge stack of encouragement notes from all sorts of people from the congregation. Thank you so much if you wrote! It was great to roll into camp, eat some of that ice cream and then read through so many messages that people are praying for my safety on the road and that this summer would be a powerful experience in my life. I also got a copy of the Saturday Globe and Mail which is now a week out of date... but who cares, I've missed out on that luxury for 5 weeks now. Hey, you are one crazy dude. That is a lot of elevation and some serious speeds. Drafting SUV's is scary to watch!